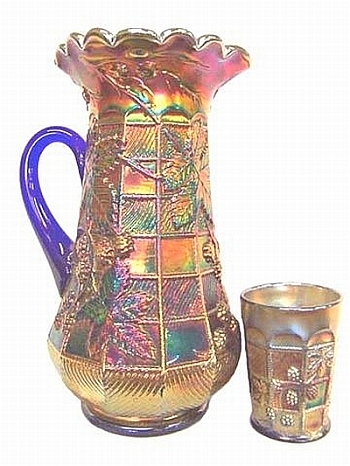 SILVER QUEEN Pitcher: These are extremely scarce pitchers. The matching tumblers are also difficult to locate. 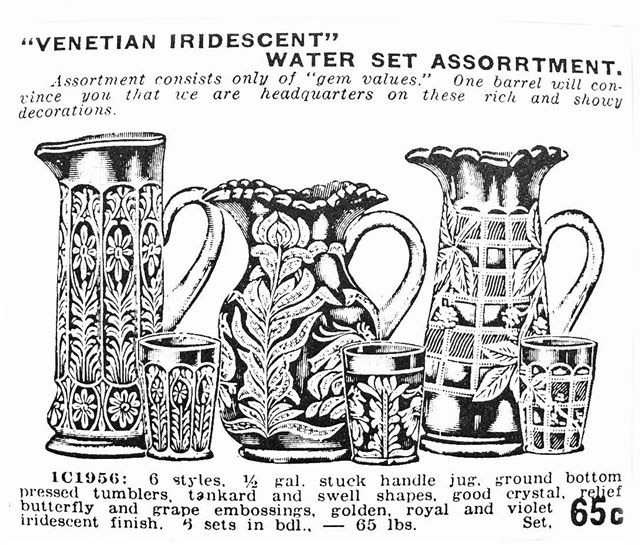 (You can see/read more in our Fenton Water Sets - Part 1.) 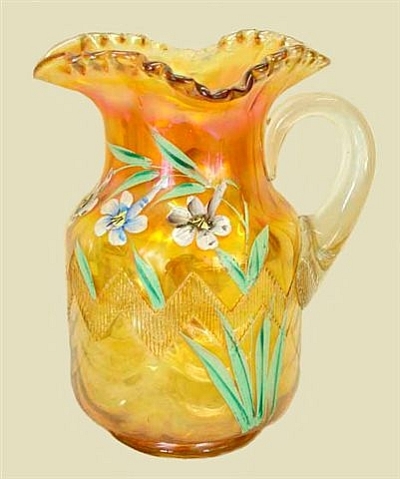 This pitcher example is from the long-time Ellen Hemm collection, which Remmen Auctions sold at Lincoln Land Convention in 2009. The painting appears to have had little wear over the years. 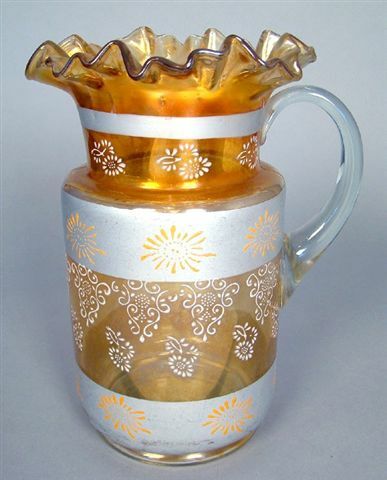 DOUBLE DAISY: This style pitcher is the same as the one used for Silver Queen. The other style sometimes found having this Double Daisy design is the Cannonball shape. This painted pattern is among the more scarce to locate. 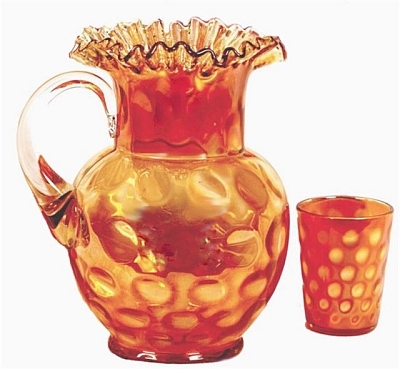 CANNONBALL Pitcher ideally suited to the do-it-yourself painter! Cherries and Blossoms is the usual decoration. 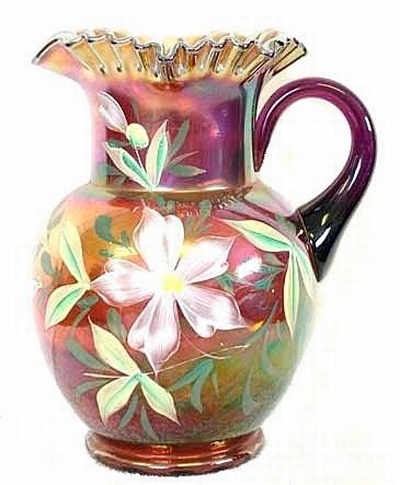 CANNONBALL Pitcher: Cherries and Blossoms is the usual painted design found on this shape pitcher. 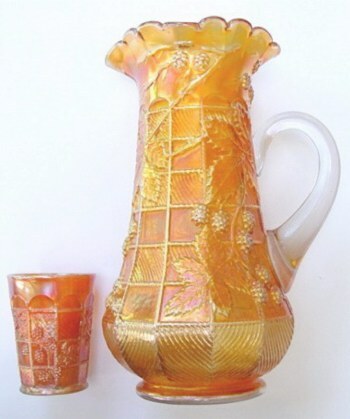 The Fenton version of this pitcher has two mould lines (where glass is joined). One is under the lip, the other under the handle. Northwood utilized the same shape, with slight variations in size. The dominant identification (provided the N mark is not applied) is that their version displays 4 mould lines. Circa 1907-1910. 7 pc. Set - $4,000. 7 pc. Set - $2500. 7 pc. Set - $725. BLACKBERRY BLOCK: We display the four colors which are available from time to time. 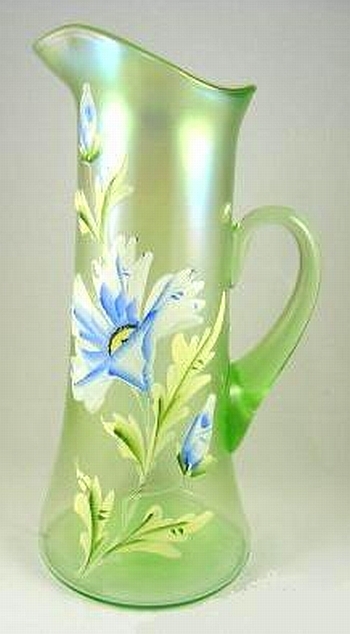 There is one known vaseline pitcher, along with only one known in white. 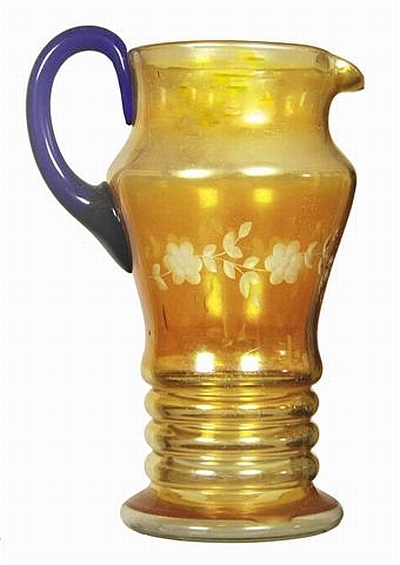 Attribution of this design is based on old mold drawings dated 1908-1909. 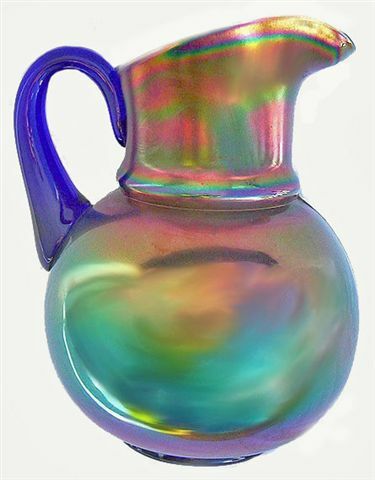 Enameled PHLOX on Amethyst INVERTED COIN DOT Pitcher. 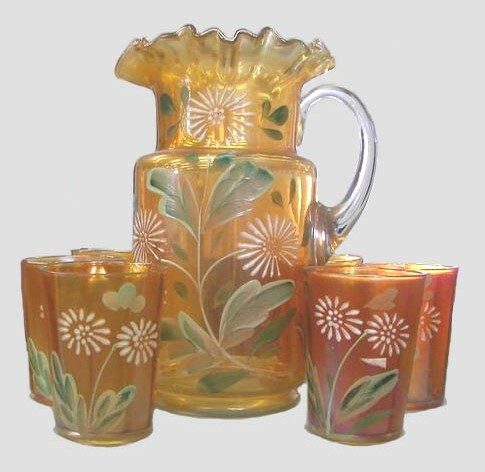 Enameled PHLOX: This enameled design has been seen on both marigold and amethyst pitchers. INVERTED COIN DOT: Seldom seen. Marigold and amethyst are known colors. 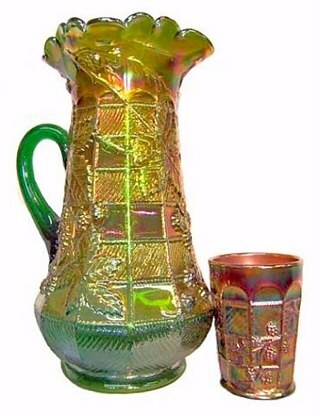 ETCHED Tankard: Dated c. 1925, this could be termed a “transitional” pitcher as iridized carnival glass per se' was giving way to the marigold items, familiar during the Depression era. COLUMBINE on Zig Zag- c.1910. COLUMBINE: The familiar Zig Zag design appears on the outside, with Interior Drape visible, as well. Ameth/purple, blue, green and marigold are known colors. in Ice Green. 12.75 in. high. DIANTHUS: Ice green and white are the familiar colors found with this enameled design. Circa 1912. 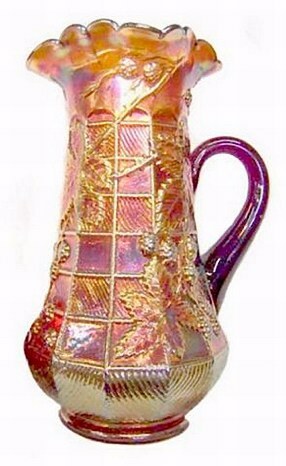 Similar to the Prism Band tankard design, minus the diagonal lines around the center of the vessel. Not everyone who says to Me, “Lord, Lord,” shall enter the kingdom of heaven, but he who does the will of My Father in heaven.